When it comes to your livelihood, you don’t have time for costly mistakes. That’s why safety and consistency matter, and it’s why we’ve made them the hallmarks of our business. We strive to produce the high-quality ethylene generators and concentrate that used to be impossible to find. Your livelihood is important, but your safety takes precedence. Ethylene application used to be unpredictable and dangerous, not to mention cumbersome. But over 40 years ago, Catalytic Generators created a way to do it better. We let you make ethylene, as needed, in your ripening room, versus storing large amounts of it in pressurized, bulky and hard-to-handle cylinders. Our generators and Ethy-Gen® II make fruit ripening easier and safer! Unlike compressed ethylene cylinders, there is absolutely no chance of ethylene explosion when using any of our generators as directed. However, a G-sized ethylene cylinder contains enough ethylene to reach the lower explosive limit (LEL) in most ripening rooms; in rooms that are 43 m3 or larger, you make ethylene as needed with our equipment and do it at such low concentrations that there is no concern of ethylene explosion. These products are typically around 4% Ethylene with a 96% balance of an inert gas. It usually contains a large amount of Nitrogen to reduce the explosion possibility, but the inert gas quantity then requires an enormous amount of the gas mixture to be introduced to the ripening room in order to achieve proper ethylene ppm level. Sometimes the mix is made with Carbon Dioxide (CO2), which is a deterrent to the ripening process; rooms have to be vented to reduce CO2 levels, so using an ethylene product that releases more CO2 into the room is not very good practice. Regardless of the inert used, this is usually a very expensive product when compared to ethylene from our Catalytic Generator. We will be glad to show you a cost comparison, so please contact us. Don’t use Calcium Carbide to ripen fruit! Several countries use Calcium Carbide as an artificial ripening agent. This is a dangerous and deadly process; when wet, the Calcium Carbide reacts with the water and produces acetylene gas, which mimics ethylene action and is used as an artificial ripening agent. However, acetylene is not nearly as effective as ethylene (much more must be used for it to be effective) and acetylene is not a natural plant hormone like ethylene. Also, this Calcium Carbide process will likely give off traces of arsenic and phosphorus, both highly toxic to humans. Furthermore, since so much acetylene is needed to mimic the ethylene action, this just intensifies the amount of toxic chemicals that are also introduced to the fruit. Consumption of fruits ripened with Calcium Carbide causes sever health problems; therefore, the use of this Calcium Carbide for ripening is illegal in most countries. Use only ethylene, the natural plant hormone & ripening agent! SAFETY and EASE OF USE are why so many fresh produce companies across the world use our generators rather than gas cylinders, other ethylene application systems or Calcium Carbide. There are documented cases of explosions in ripening rooms where cylinders were in use. View our page on ethylene explosions. The “use of cylinders of pure ethylene should be vigorously discouraged”. 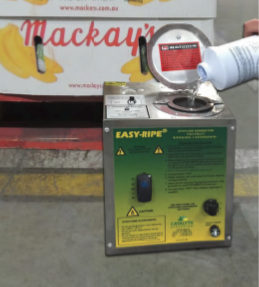 The UK’s Health and Safety Executive/Local Authorities Enforcement Liaison Committee (HELA) explains that generators are the preferred options for ethylene application and that the “use of cylinders of pure ethylene should be vigorously discouraged.” For more information please click here. Our Ethy-Gen® II Ripening Concentrate is the only ethylene ripening liquid that has passed the stringent standards of both the US-EPA and UK-CRD. So you can be sure of the purity and safety of what comes out of the ethylene generator when you only pour in Ethy-Gen® II!! This makes it easy to track inventory and reorder accordingly. With cylinders, how does the ripener know if there is 60% or 6% gas left in the cylinder? Likewise, how do you know that you are really buying a completely full cylinder? Without actually weighing the cylinder, you don’t… its guesswork. You can look at the pressure gauge and get an idea, but since you can see Ethy-Gen® II, you know you’ll have ethylene. The CRS requires less attention than cylinders, thanks to a large supply of Ethy-Gen® II connected to the system. This container will last over 4 times longer than a G cylinder of ethylene! Also, our system makes it easy to change containers, with quick disconnect fittings. Our generators are listed by Underwriter’s Laboratories (UL®) or TÜV SÜD America, meaning that they have found our equipment to be safe from any foreseeable risk of fire, electrical shock, and related hazards, when used as directed. Catalytic Generators is the only ethylene generator company with products certified by both UL and TÜV. There’s a reason that ripeners all across the world choose the ethylene application products of Catalytic Generators Australia. Our generators are the safest, our Ethy-Gen® II is the best, our customer service is quick and our products are easy to use. And that’s the simple truth. Give us a try today.